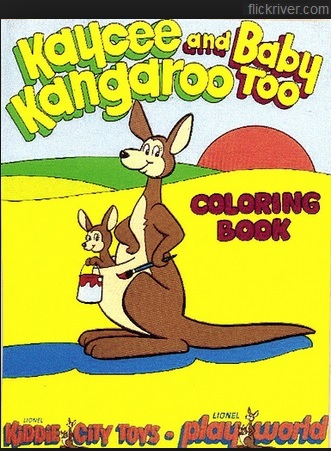 Kangaroo | I'm not stalking you. Kiddie City: Did It Really Exist? My husband does not believe me that there used to be a toy store called Kiddie City, very similar to Toys’R’Us. In fact, there was a Kiddie City right in nearby Sylvania, Ohio, which still has a Toys’R’Us. I had to prove it to him by Google-ing it the other day. My recent and short-term memory might be junk, but I can remember some things from my childhood very clearly. Plus, Kiddie City is one of those things I have clung to all these years, so I would not forget it. Like that Punky Brewster’s dog Brandon was named after head of NBC, Brandon Tartikoff. 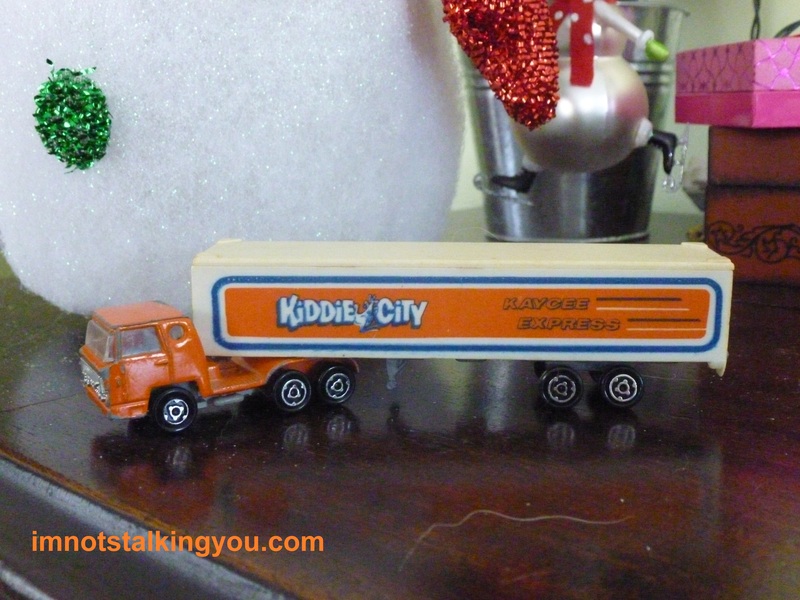 Official Kiddie City semi truck, from my personal collection, circa 1980. My mom and I always shopped at Kiddie City. I always thought of Toys’R’Us as inferior (I still do). Apparently my tiny pre-schooler brain was pretty on-track, because according to Wikipedia (where any info I site here on out in this post comes from), Kiddie City was the second-largest toy chain in the United States. They were owned by Lionel, of model railroad fame. I asked my mom where it was located, and her memories do not seem to match mine. That doesn’t really mean anything. We could both be wrong. She thinks it was in the shopping plaza where Major Magic’s was for many years. The location would make sense. My mom never traveled very far into Sylvania/Toledo on her own. That would be an easy location for her to get to and regularly find. I have memories of looking at toy robots in a toy store when I was a kid. I remember blue, metal shelves (kind of like Cosco). I have no idea if that would have been Toys’R’Us or Kiddie City or just my imagination. I like to think maybe that was Kiddie City. When I got my swing set when I was a kid, I know we bought it from one of those two stores in Sylvania, but my mom doesn’t remember which one. But I think maybe that was Toys’R’Us. Apparently Kiddie City declared Bankruptcy in 1982, reducing their store count from 150 down to 55 stores. This is most likely when the Sylvania store closed. They grew back to being the fourth-largest toy store in the country before the stores were all closed for good in 1993. Gone, but clearly not forgotten. I would so LOVE one of these shirts! Posted in Childhood Reminiscing and tagged 1980's, bankruptcy, Kangaroo, Kaycee, Kiddie City, Lionel, model, Ohio, retail, shopping, store, Sylvania, toy, Toys'R'Us, train. Bookmark the permalink. I wrote on Tuesday about how much I used to eat and enjoy MicroMagic products. 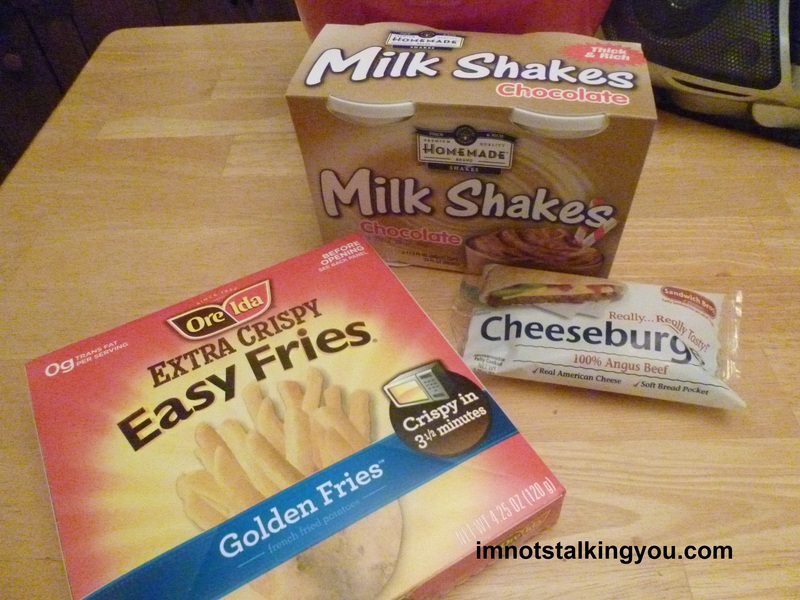 If it is microwave hamburgers you are looking for, you do have a few choices still available in stores. I had to go especially buy one to take a picture of for this post because, in the past, I kept eating them before I could get a picture. 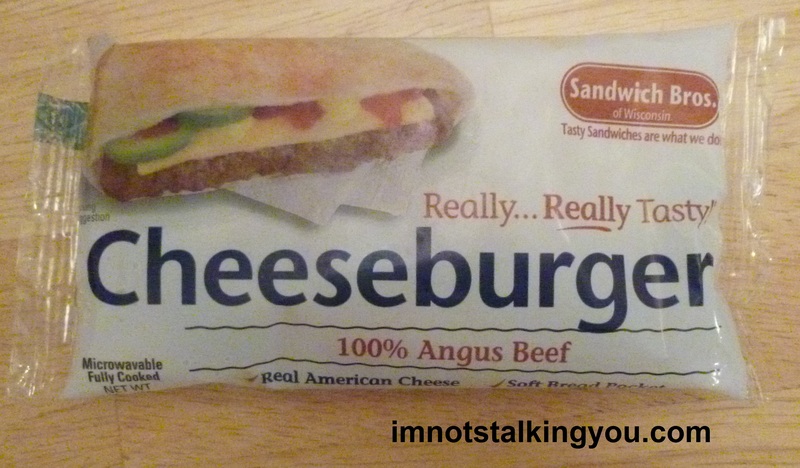 Pita Cheeseburgers made by Kangaroo Brands, Inc. remind me a lot of MicroMagic burgers (I evaluated the cheeseburger variety for the sake of my hunger, and this post.) They still possess the microwave convenience that you enjoyed of yesteryear. I will warn you right off the bat you only get a half a burger per package. The burger is also quite thin, but this allows it to heat more evenly. It has a good fake-smoke taste. Since it comes in a pita, there is no bun to get overcooked. They are good to get your burger fix on, if you only want a half a burger. (I usually eat one for lunch, then supplement with chips or cookies.) If you are a big guy, you would definitely want to pack at least two into your lunch box. They are good, but I must admit that the cheese-like substance on it that doesn’t melt in the microwave does disturb me. If you live where there is a Meijer store near you, you are in luck. Meijer had great frozen hamburgers, cheeseburgers, and chicken sandwiches. 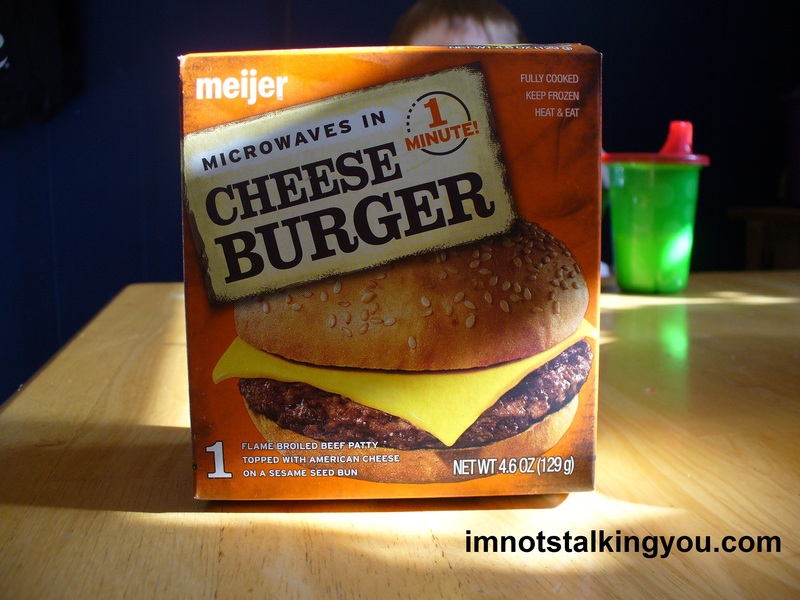 Great, ya know, considering it is a frozen, then microwaved highly processed burger. What to do if that bothers you? Nothing fancy here. They come on traditional sesame seed buns. and if you catch one of Meijer’s famous “10 for $10 and the 11th is FREE” sales, well, then that makes these burgers cheaper than pita burgers or McDonald’s–with the bonus that they will survive in your freezer for months! Perfect in case of an unanticipated zombie apocalypse. Of course, there is always the option of White Castle frozen burgers. They satisfy my craving sometimes, but I feel like they are an acquired taste (READ AS: grease & onions). 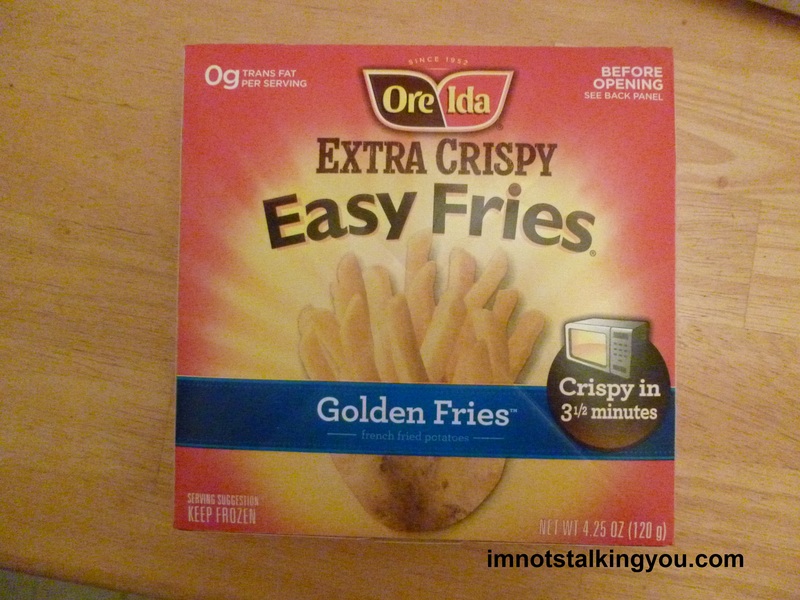 I believe the only major microwave french fries available right now are Ore-Ida Extra Crispy Easy Golden Fries. They are a good facsimile of the grease and cardboard taste of the old MicroMagic. I knew of the burgers and fries listed above before I started this post. They are actually what made me nostaligic for the old MicroMagic of yesteryear. But I didn’t know of any companies currently selling microwaveable milkshakes in stores across the country. And even if there were, I do not think they would be as tempting to buy without the microwave fast food branded trifecta that MicroMagic represented. I found Homemade Brand Microwave Milkshakes. 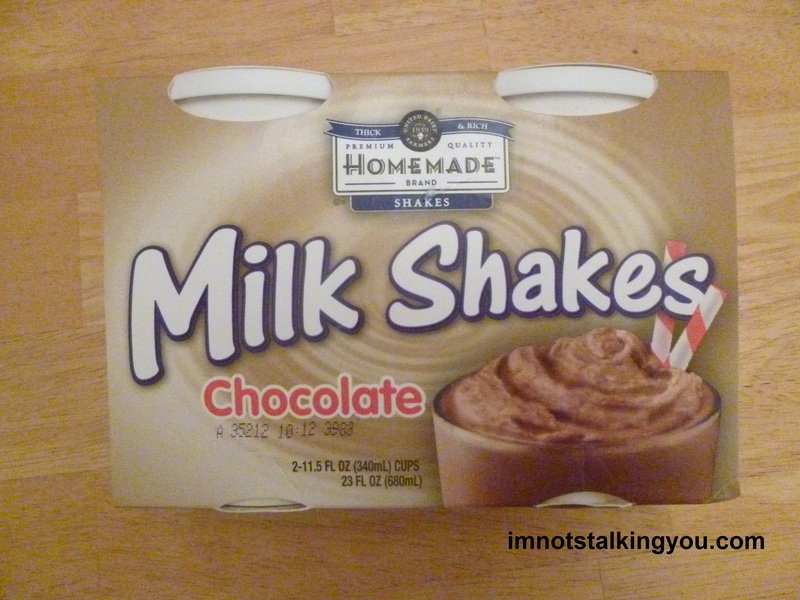 I taste-tested the chocolate milkshakes. They were good. I erred on the side of less microwave time, so it was still thick. It wasn’t super creamy, but definitely hit the spot. Well, the half of the cup I managed to wrangle away from M, my two-and-a-half year old anyway. I also found a company called Cold Cow Ice Cream that is apparently putting in freezer/microwave combo display units in convenience stores across the country to satisfy your need for sweet that cannot be satisfied with candy bars or the usual ice cream novelties found in party stores, or the ice cream store that is likely right next door or down the block. I am very glad they did not have one of these in my store when I worked there. I would have eaten one every day. There website has a “milkshake finder” option to find the space age milkshake vending contraption closest to you. I found this humorous how-to on YouTube.com. I thought I would share. Posted in A day in the life and tagged apocalypse, bacon, burger, cheeseburger, Cold Cow, French, fries, frozen, hamburger, homemade, Kangaroo, Meijer, microwave, milkshake, Ore-Ida, pita, zombie. Bookmark the permalink.